SIP panels consist of an insulating foam core sandwiched between two oriented strand boards. They combine structural insulation, framing, and sheathing all in one product used for walls, floors, and roofs. Typically, these panels are precut and delivered ready to assemble at a construction site. The standard thickness of these panels ranges from 4 ½ to 12 ¼ inches with lengths as much as 24 feet. Some manufacturers also work with custom sizes; however, this could increase the costs. 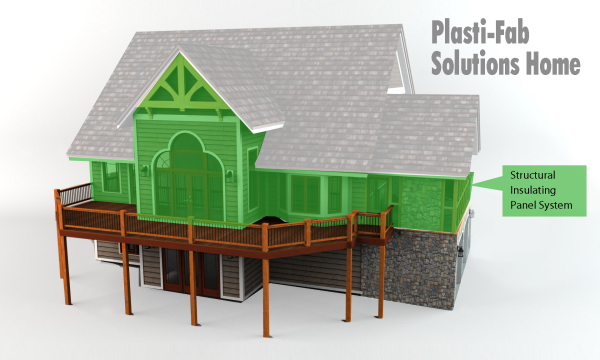 SIP panels are a well-established building system. They have a long history in the US housing industry. Early versions of these panels came into existence in the mid-30s, and the first ever foam panel manufacturing took place more than half a century ago. Today, R-control SIPs have broken into mainstream housing construction and they offer several benefits over the conventional stick framing method. Compared to standard stick frame construction, SIP construction results in a much tighter, and insulated structure, one with a potentially higher insulation value. Using SIPs may also make it possible to scale down your cooling and heating equipment. They come with lower operating costs and ensure net gain over the standard or conventional construction. SIP panels come with foam cores; however, these could vary in terms of materials. The most common type of foam in these panels is the EPS (expanded polystyrene), with an R-value of about 3.6 per inch. It’s a popular choice among builders. Among the cores available, EPS is the least expensive one available. Almost identical in chemistry, these two foams come with an R-value of 5.5 per inch. Compared to EPS, they are more expensive and not easily available. Compared to the two options mentioned above, extruded polystyrene is much more expensive, with an R-value of five per inch. Faster Construction: companies manufacture these panels, which are later sent to the construction site ready for the installation process. With the help from a crane, builders can assemble the wall sections within a short period of time. This reduces the construction time from weeks or months to just a few days. Less Chance of Air Leaks: unlike the old stick framed walls, structural insulated panels have no pockets, thus, reducing energy loss caused by internal convention. With continuous insulation, this means that homes with SIPs have less air infiltration compared to framed homes. The trick here is to use careful workmanship to eliminate any chances of air leaks at the panel joints. With time, leaks could lead to structural damage, and condensation damage, especially roof panels. Reduced “Thermal” Bridging: the entire core is insulation. With lumber, the energy loss due to thermal bridging is far greater than the continuously insulated core that SIPs provide. Higher R-values: a standard wall section come in a thickness of 6 ½ inches. With the core of foam, the R-value of the walls becomes roughly twice as high as compared to the standard stick frame options. Superior Strength: SIP panels help to create a strong building, unlike that of I-beams. These panels are resistant to shear loads, racking and withstand seismic activity and high winds. Structural insulated panels are a great choice for modern homes. If you are planning on building a home, it is best if you consult with your local construction professional for more information on the right type of SIPs to use for your home.